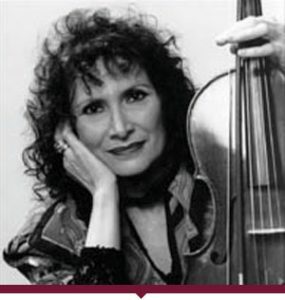 Rivka Golani is recognized as one of the great violists and musicians of modern times. Her contributions to the advancement of viola technique have already given her a place in the history of the instrument and have been a source of inspiration not only to other players but also to many composers who have been motivated by her mastery to write specially for the viola. More than 250 pieces have been written for her, including over 60 concerti to date. Leading orchestras with which Rivka Golani has performed as soloist include the BBC Symphony, BBC Philharmonic, Boston Symphony, Royal Philharmonic, Royal Concertgebouw, Israel Philharmonic, Tokyo Metropolitan, Montreal Symphony, Toronto Symphony, and many others. Her on-stage charisma unfailingly adds excitement to her appearances, and her reputation as a teacher draws students from all over the world to her master classes. An inspiring teacher, Rivka draws students from all over the world to her master classes. She teaches at the Birmingham Conservatoire and Trinity College in The United Kingdom and regularly holds masterclasses in Spain, Canada and Israel. Recent highlights include the release of a 3-CD set of works for solo viola by Johann Sebastian Bach: the six suites, the Bach-Kodaly “Fantasia Chromatica”, and the “Chaconne” (CBC Records – MVCD 1141-3). A CD released last year features Rivka performing a viola concerto written for her by Polish composer Peter Paul Koprowski (CBC Records-SMCD 5206)with Toronto Symphony, and – in 2004 – no less than four world premiers of concertos written for and dedicated to her, with four more programmed for 2006. She has just recorded a CD of virtuoso pieces scheduled for release in 2006. Born in Israel – Rivka Golani trained at the Music Academy of Tel Aviv (now part of the University of Ramat Aviv) with the great violist and composer Oeden Partos. At the age of 23, she became a member of the Israel Philharmonic. She moved to Canada in the mid-1970s where she taught at the University of Toronto and began her solo career. She now makes her home in London, England.